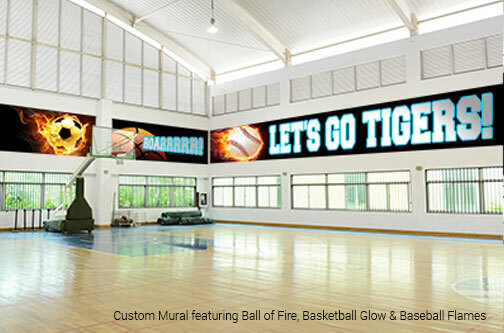 Wallpaper wall murals and wall graphics from Magic Murals are the ultimate way to bring school spirit and impactful learning to your school. Our custom murals are created according to your specifications and are installed with a simple peel and stick process. Contact us to see how Magic Murals can build a sense of community and instill pride at your school. And while you’re at it, see how you can bring lessons to life with educational murals of world maps, geography, local and global places of interest, historic events, and more. 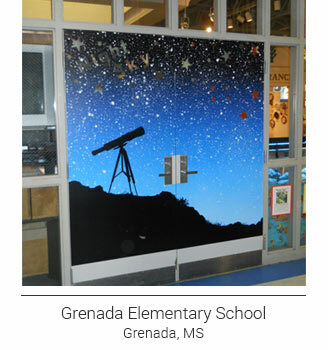 To shop our collection of School Murals, click here. If you don't find what you're looking for, please call us at 877-448-7295 or email us at service@magicmurals.com and we'll be happy to do a custom image search for you and find exactly what you need. Complete the Schools & Libraries Request Form below for our exclusive offers. Please include your mailing address to receive our Swatch Kit One, mailed via U.S. Postal Service. Schools and libraries around the country are reporting that our ColorMe! 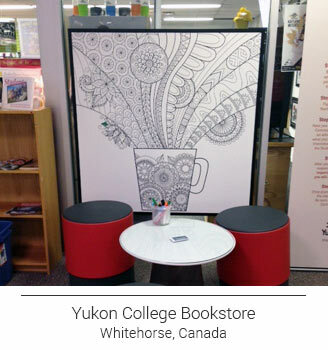 coloring murals are a great way to get their students (and staff) together for a fun study break or an exercise in collaboration. These line drawing murals of everything from animals to zentangle-type mandala designs can be colored with pens, pencils, crayons, markers and acrylic paints. They can also be laminated with a dry erase covering so they can be used over and over again with erasable markers. On the playing field, mascots bring crowds to their feet and rouse competitive passion in athletes. Carry that energy inside with our contour-cut graphics. These captivating cutouts trim around the edge of your logo, mascot or athletes, capturing them in action and turning them into a larger-than-life symbol of the excitement and pride at your school. Create inspirational messages with contour cut lettering. Select the font, size, color and arrangement, and we’ll maximize the wow-factor of your mottos and mission statements. Colorful custom lettering is your best bet for memorable motivational statements in locker rooms, vibrant customized signage in front offices, or anywhere you need to convey one-of-a-kind messaging in an educational or athletic setting. 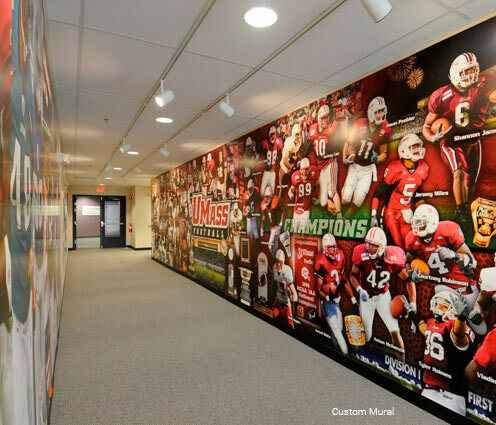 Boost school spirit and build a sense of community by incorporating your logo, student photos and school colors in custom art for hallways, foyers, sport venues, reception areas, and more. Logo accents and personalized imagery strike a chord with students and bring excitement, great memories and school pride to the forefront. We can help you show off the best things about your school – students, teachers, athletes, parents and projects – with high-impact logos, mascot graphics and panoramic photo collages. Magic Murals offers a variety of durable products that stick tight to walls of any surface. Our peel-and-stick products make installation so easy a third grader could do it! As any science teacher knows, what goes up must eventually come down. When that time comes, our murals can be removed with just a tug at the corner and no damage to the original wall surface. Even better? Most products can be reinstalled in another location. QuikStik™ for smooth walls offers a durable film lamination option to protect the mural and underlying wall from whatever the school day throws at it. No need to hire a professional for installation. Just peel the backing and press to the wall. QuikStik Plus™ and RoughStik™ materials bind fast to textured walls and are also installed by simply peeling and sticking. For exterior and floor applications, try concrete graphics and products designed for exterior walls. Choosing a Magic Mural means choosing quality. For more information about materials, call us at 877-448-7295 or compare materials online here. 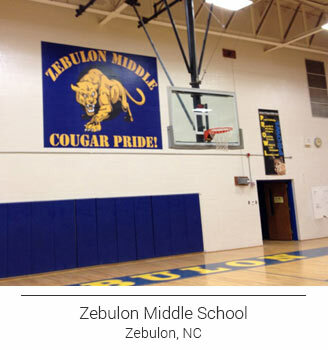 EDUCATIONAL MURALS: BRING LESSONS TO LIFE! Students learn better when they can see, touch and visualize. Bring your lessons to life by creating a learning center that surrounds students with vibrant, memorable images. We can help you to create a stimulating atmosphere for students who are experiencing their lessons, rather than reading from a textbook. Picture it: the galaxy stretched out across the walls and ceiling in a science classroom. Arlington Cemetery, Mount Rushmore, or your state capitol building reinforcing lessons in a social studies room. Can’t bring your students to the Jefferson Memorial? Bring the Memorial to them! 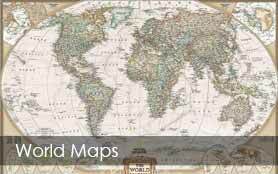 Search our database of thousands of images for local interest areas, famous landmarks, geographic wonders, and places of interest from around the world. Cater to all kinds of learners by augmenting lectures and activities with impactful images. 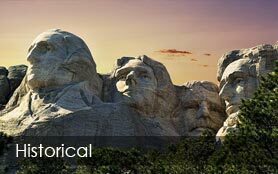 Our Library of Congress collection contains poignant historical images and countless geographic landmarks. 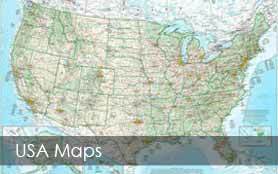 Our Maps & Flags collection, including Essential Geography of the U.S., brings the world to your classroom. We can help you to create a stimulating atmosphere for students who are experiencing their lessons, rather than reading from a textbook. Students learn best when they are involved and engaged in the lesson. Dry Erase murals are a fantastic way to let students work collaboratively, teaching each other and using their imagination and critical thinking skills to solve problems. 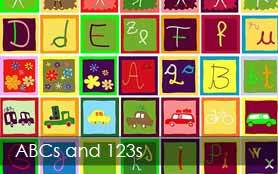 They’re a great tool for teachers who want to add color to their lessons. 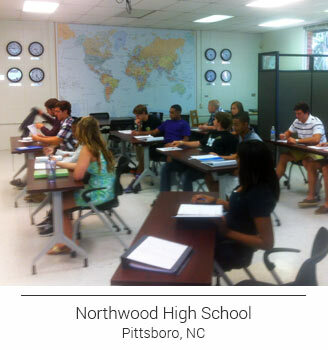 personalization with your graphics, school motto, etc. * for exterior, concrete, gymnasiums, windows, etc.